This app shows the current speed in google maps, other navigationapps or any apps installed in your smartphone. It automaticallydetects when your app of choice is launched and shows the overlaywith a speedometer. * No advertisements* Monitor the launching andclosing of google maps or any apps you wish to associate it with*Speed overlay will open or close when the associated app islaunched or closed* Choose between miles, kilometers or knots (mph,kmph or knots)* Adjust the transparency of the overlay*Automatically adjust the font size based on the size of theoverlay* Move to any location* Adjust the overlay size* Stores thesize and the location of the overlay* No internet necessary* Touchonce to show the toolbar* Can be used with any app installed inyour smartphoneHow to useAfter installation start the app once. Youcan choose the apps which should be associated with the overlay. Bydefault google maps will be associated.There is a paid app herehttps://play.google.com/store/apps/details?id=com.d4Apps.maps.mapspeedview.Please use the free app to confirm that this work hassle free inyour smartphone before you make a decision to buy the app.If youfind any difficulty in using this, please contact us, we will tryto fix it in the next version. SpyCam is one of its kind where you can capture images by the pressof your volume button even when the screen is locked. Nobody willnotice that you are taking photos. - Operate even when the SCREENIS OFF.- Take picture at the press of VOLUME BUTTON up / down- Nopreview, no shutter sound, no flash.- Adjust the exposure forensuring good quality photos- Option to set different picture sizesfor front and back camera- Set the display orientation- Can settime stamp for the picturesNote: While installing in Marshmallow,Camera and Storage permission is required.If you face any issueswith the app, please send a mail. Low rating doesn't help. We willrespond as soon as possible. This app shows the current speed ingooglemaps, other navigation apps or any apps installed inyoursmartphone. 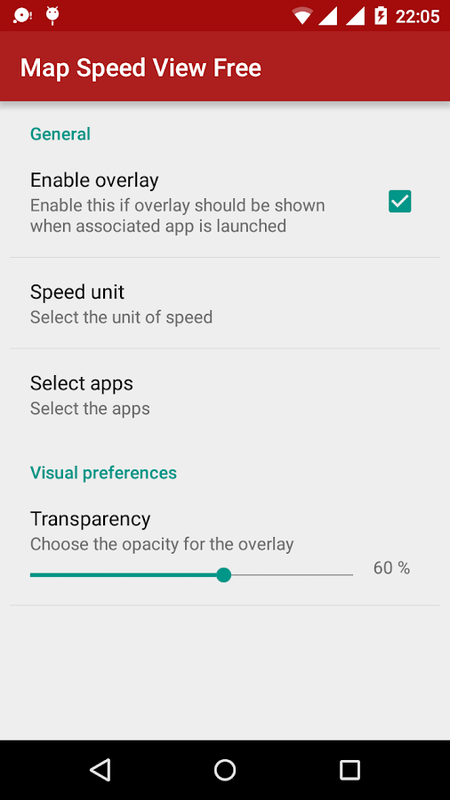 It automatically detects when your app of choiceislaunched and shows the overlay with a speedometer. * No advertisements* Monitor the launching and closing of google maps or any appsyouwish to associate it with* Speed overlay will open or close when the associated appislaunched or closed* Choose between miles, kilometers or knots (mph, kmphorknots)* Set the speed limit. Over that speed, the overlay will blinkinred* Adjust the transparency of the overlay* Automatically adjust the font size based on the size oftheoverlay* Move to any location* Adjust the overlay size* Stores the size and the location of the overlay* No internet necessary* Touch once to show the toolbar* Can be used with any app installed in your smartphoneHow to useAfter installation start the app once. You can choose the appswhichshould be associated with the overlay. By default google mapswillbe associated.There is a free appherehttps://play.google.com/store/apps/details?id=com.d4Apps.maps.mapspeedview.free.Pleaseuse the free app to confirm that this work hassle free inyoursmartphone before you make a decision to buy the app.If you find any difficulty in using this, please contact us,wewill try to fix it in the next version. Why to have an app with functionalities you never use. Featuring asimple and intuitive no fuss torch. * Automatically switches on thelight when the app is started* Quick startup* Works even when thescreen is locked* Intuitive UI* Very small app (approximately 1.1MB)* No spywareNote: While installing in Marshmallow, this apprequires camera permission (flashlight hardware is attached theCamera for opening the light, thus it asks for permission). It is a digital speedgauge app which uses GPS system. So you willneed an active GPS connection for the app work. You can use thisapp with bike smartphone holder and anything else, especially HUDwith your car. HUD means Head Up Display. It shows you totaldistance, trip meter, max and current speed. Kilometers(km/h),miles(mph) and Nautical mile(kts,knots,kn) are supporeted in thisapp. NOTE: Due to phone GPS limitation, It may not work well incloudy weather or indoor places. And I don't guarantee that itshows accurate data because of GPS errors. GPS Digital HUD Speedometer on Map Live * GPS Speedometer for Cars, Bikes, Bicycle,Trucks * Show Accurate Speed In Digital SpeedMeter * Show Accurate Speed In Analog Speed Meter * Show SpeedAlarm if driving too Fast * Car Tracking on Earth Map Live *Maximum Speed , Average Speed, Total Distance CoverSpeed GPS is anadvanced speedometer application that uses the phone's built-in GPSsystem to show your current and maximum speed. Suitable for cardriving and biking.The speed is display in both analog and adigital value. It acts as a normal digital and analog Speedometer,which you may find in any car that showing the velocity of thevehicle in kph and mph. Its best application for broken Speedometerof car or not working then download this app and enjoy yourspeedometer .Our Developer tries best to make all readings asaccurate as possible, but the accuracy also depends on yourdevice's GPS sensor and should only be treated asapproximations.You can use this app as GPS Odometer with bikeSmartphone holder and anything else, especially HUD (Head UpDisplay) with your car. You can track your GPS speed with one ofthe best GPS Speedometer App.Features:i. Easy to Use HUDSpeedometer GPS.ii. Simple interface and smooth functionalitiesodometer.iii. Precise speed and attractive display.iv. No internetaccess necessaryv. Digital and Analog speedometer.vi. Multipleprofiles: for every car, bike cycle.vii. The speed can be displayedin one of three different units: kilometers per hour (km/h), milesper hour (mph) or knot (nautical miles per hour).viii. Speed isdisplayed both with an analog gauge and as a digital valueix. Youcan change this scale any time on the move.x. Simple and quick inaction Speedometer. If you are looking for an odometer andspeedometer for Car or Bike cycle, then download our GPSSpeedometer-Odometer app. This application is a GPS-based Speedometer showing the speed ofthe device it is installed on. The speed is displayed both with ananalogue gauge and as a digital value. Your max speed and averagespeed is also shown together with a tripmeter and an odometer. Moreadaptations of your own choice is possible, see the details below.Functional description: * Analogue and digital speedometer. *Choose from four different speedometer resolutions for the analoguegauge: 0-30, 0-60, 0-120 or 0-240 speed units. * The speed can bedisplayed in one of three different units: kilometers per hour(km/h), miles per hour (mph) or knots (nautical miles per hour). *When unit km/h is selected the speed in m/s (meter/second) is alsodisplayed. * When unit mph is selected the speed in fps (feet persecond) is also displayed. * Max speed * Average speed * Tripmeter* Odometer * Possibility to pause the meters by a "long click" onthe screen.